Punjab National Bank is one of the Largest bank in India. PNB always provides better & safer services to their customers. Punjab National Bank also offers internet banking, mobile banking & SMS banking like all other banks. Ordinary people are able to use most easily. To get mobile banking facility, We go to the bank and fill up form, then after 2 to 3 days, we get a password. Thereby needed to contact the bank again and again. This process is still, But now if you have an android smartphone then sitting at home, you may activate the PNB mobile banking facility. 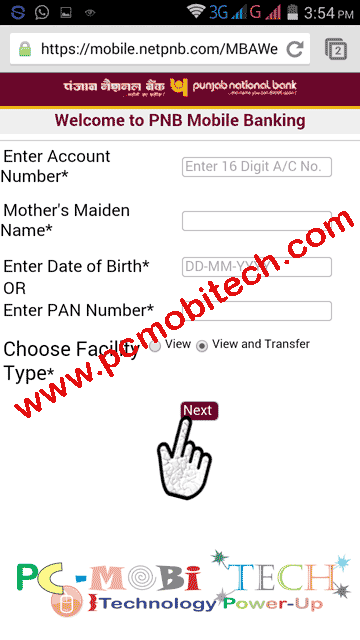 How to register for PNB mobile banking facility online? Mobile Banking is a feature that allows you online transaction, money transfer, mobile-dth-data card recharges, bill payments etc. Punjab National Bank also offers mobile banking application software for your android smartphones. So you can safely use the mobile banking facility with PNB Mobile banking app. So today I will tell you how you can activate Mobile Banking service online? Mobile banking service can be activated with the help of your android smartphone. To activate the service, you can use any browser on your smartphone. But the website opens only on mobile/smartphone, not on the PC. One the next page you must accept the terms & condition. Click Continue to accept. On next, You must fill in the information related to your account. Enter Account Number*- Enter here your 16 digits bank account number. Enter Date of Birth*- Enter Your date of birth, which is the register in your bank account. Enter PAN Number*- Enter Your PAN (Permanent Account Number), which is the register in your bank account. Note- Date of Birth & PAN, Here you must fill out only one. Choose Facility Type*- Select “View” radio button if you only want to see Balance information and if you prefer to use PNB Mobile Banking service for transferring fund along with the balance check then Select “View and transfer” radio button. After filling Account information correctly a message 6 digits OTP (One Time Password) will receive on your registered mobile number. Check SMS OTP & fill here and tap on Next. Debit Card Number- Enter the code in the Debit Card Number box. 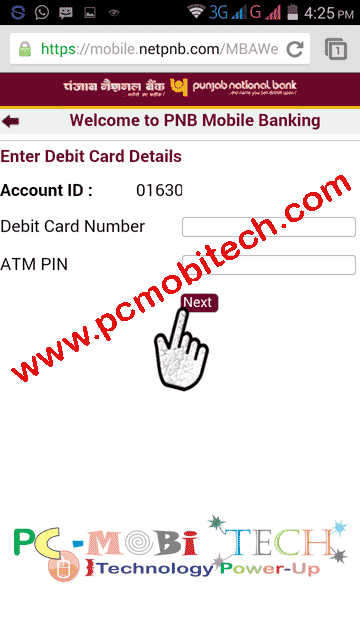 ATM PIN- Enter here 4 digits ATM/Debit card PIN code. 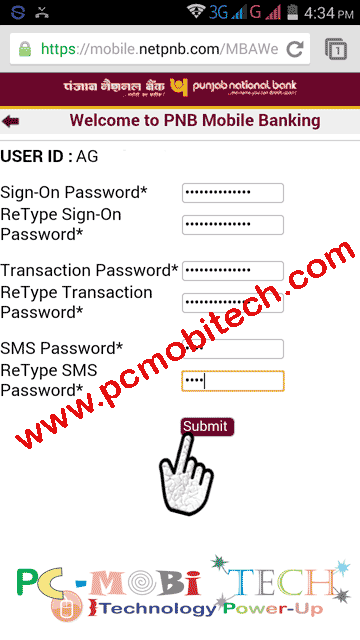 Now create a Sign-On Password, Transaction Password & SMS Password. You can make Sign-On Password & Transaction Password strong using some special characters ^&@$#%* and SMS password can only have four digits (for eg. 2456). After creating a strong Sign-on, Transaction, SMS password tap on the submit button. If you have made the correct password according to the rules, the success of the registration message will appear on the screen. That’s it! Now you have been successfully registered online for your PNB mobile banking service. How to activate PNB-Mobile-banking app. How to Activate PayTm App and add fund to the wallet. Thanks for reading, Any problem or suggestion leave a message in the comment box. Did you open the link via Smartphone Browser? It opens only in mobile. after selecting view and transfer it’s not going ahead sir…. not showing any further details…what to do now? any UserID/Password become enable after 24 to 48 hours..
You Can enable Transaction feature via, Internet Banking and with Mobile banking. In PNB Mobile banking app Go to More and tap on Enable Transaction option and after this you will receive a OTP on your registered mobile number and then enter OTP on Mobile banking app screen. If you are getting already registered message, thus means you have registered mobile banking facility through your banking branch. User ID may be available on Passbook something like AGG001234, if this is not available on Passbook then contact to your Bank Branch, ask them for your User ID. Only they can help you. My name is arif and I have not user id pnb mbanking then how I recover user id. Every PNB account holder has their own unique user id Eg: AGG00xxxx. So Just check your Account passbook. Please Contact to the Customer care or Bank Branch. Only they can help you. my registration for net banking thru ATM is done but i didnt get the password yet.. ..
plz let me knw wat can b done..
You can generate a password online with net pnb website. Contact to the bank. Fill-up the Internet banking facility form and submit it. Bank will activate Internet banking on your User ID and also will give you password. And you can also register for INTERNET banking online but first you will need to activate Internet banking on your user ID through your Bank. 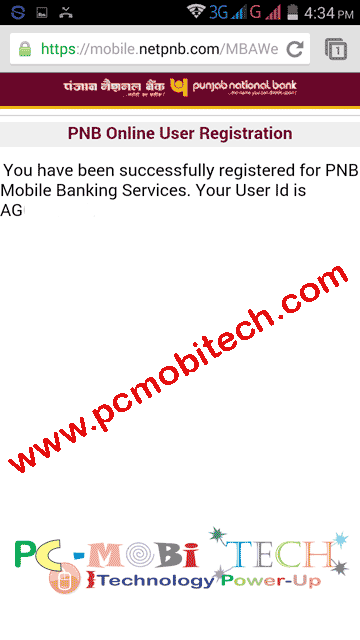 I have registered pnb mobile banking for view only. Now i want view and transfer. What will i have to done? Login to PNB mobile banking service. After login tap on “Personalize” option at the main screen. And use “Enable Transaction” to enable transaction facility on Mobile banking. Please contact to the bank, if you have forgotten the password. Pramod ji how I can activate transactions service in mobile banking. I am unable to transfer fund. Hello Ratan, when you are registering PNB Mobile banking, On account information page select “View and transfer” radio button.